Zhmurko Systems provides design, installation and configuration services for monitoring solution based on open-source Icinga2 system. Icinga is an open-source monitoring solution, derivative of well-known Nagios Core system. It is a next monitoring systems generation – shipped with built-in features for scalability, reporting and data graphic presentation. Set of components can be enabled on-demand. 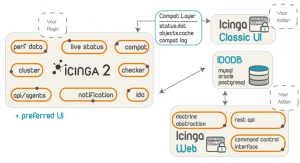 Icinga2 provides external interfaces compatible with Icinga 1.x, like the IDO DB (Icinga Data Out Database). Built-in cluster stack secured by SSL x509 certificates for distributed monitoring and parallelized service checks has been introduced in this second version. Icinga has an ability to define network host hierarchy using “parent” hosts, allowing detection of and distinction between hosts that are down and those that are unreachable. It has an ability to define the handlers to be run during service or host events for proactive problem resolution. Event handlers are optional system commands (scripts or executables) that are run whenever a host or service state change occurs. They are executed on the system where the check is scheduled (initiated). Simple plug-in design allows to develop checks for any necessary services easily. Monitoring plugins exchange web page contains hundreds of check implementations for any services. Clickatell’s SMS gateway enables businesses, financial institutions, governments, and communities to leveragemobile messaging to inform, alert, notify, transact, interact, and share. Optional extension for SLA reporting that distinguishes between critical events from planned and unplanned downtimes and acknowledgement periods. 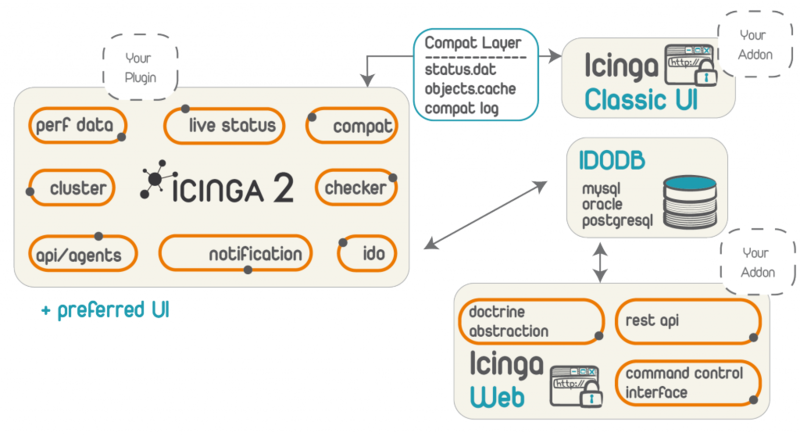 Icinga 2 contains an built-in implementation of performance graphing via add-ons such as PNP4Nagios, NagiosGrapher, InGraph, Graphite and Grafana. There is a module to integrate Icingaweb2 and Graphite. 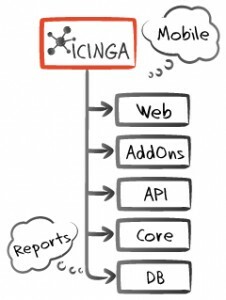 If you have any questions or need a Icinga2 support, feel free to contact our team.